[GUIDE 2019] How To Choose A Built-In Coffee Espresso Machine? Let’s talk about coffee. The first thing that pops into my mind when I think of coffee is the picture of a sunny summer morning, where I’m sitting on my balcony and enjoying a cup of espresso. As the title implies, this addresses the need of serious coffee lovers who would like to take their relationship with coffee one step further. First of all, I should explain what exactly a built-in coffee machine is and why it is much better for a coffee lover, compared to the regular drip-coffee one. For most people who can’t live without their dose of caffeine, the line between drip style coffee and coffee made with a built-in machine can be a bit fuzzy. What is so special about built-in coffee machines that can make us change our perfectly adequate coffee habits? Built-In Coffee machines, what’s so special about them? The uniqueness of integrated coffee makers, lies not only in the coffee they produce but also in the design upgrade they provide. First, I need to describe the process that built-in machines operate, in order to help you understand the method they produce coffee. Most people are familiar with the process of making drip-brewing, filtered or pour-over coffee, a method which involves pouring water over roasted, medium ground coffee beans contained in a filter to get the coffee. An espresso machine, forces hot water through ground coffee under pressure, to make your coffee. Whether using a simple pour-over set, an electrical coffeemaker or a semi-automatic coffee machine, they are all trying to achieve a perfect brew. Built-in coffee machines produce coffee in a different way, which kind of resembles the procedure that the barista in your local café operates. They all have a bean hopper that you can place the beans of your favorite coffee flavor. If that is not what you like, they also contain a bypass dozer giving you the option to make pre-ground coffee. That is convenient you want to make a decaf or other specialty pre-ground coffee without removing the beans loaded in the machine. From the hopper, the beans are usually fed to a grinder. These machines grind beans fresh for every brewing cycle. When the coffee is grounded it is delivered to the brew group, where the coffee is compressed and hot water is forced through that coffee under pressure. Then the coffee is delivered to you through a spout, which you can adjust to the size of cup you are using. Regular semi-automatic machines require much more time and might not produce the same result every time you use them. Why? as they usually need some basic skills in order to get good results. Built-In coffee machines produce good coffee consistently, with a press of a button or two, start to finish, without user intervention. That means that anyone can use them to make coffee anytime they like. Some even call them One-Touch machines for that function. Moreover, built-In coffee machines are considered to be the new stylish must-have for coffee lovers. These are not your ordinary coffee machines. They provide an elegant designer touch in the house. They.. give your kitchen a special character, which contains a bit of your coffee loving personality. That means that if you are thinking of redecorating your kitchen and you are serious about your love for coffee. Consider an integrated coffee machine would be a great addition, as it combines good coffee with an elegant and fancy looking appearance. What do I need to know before I buy an integrated coffee machine? 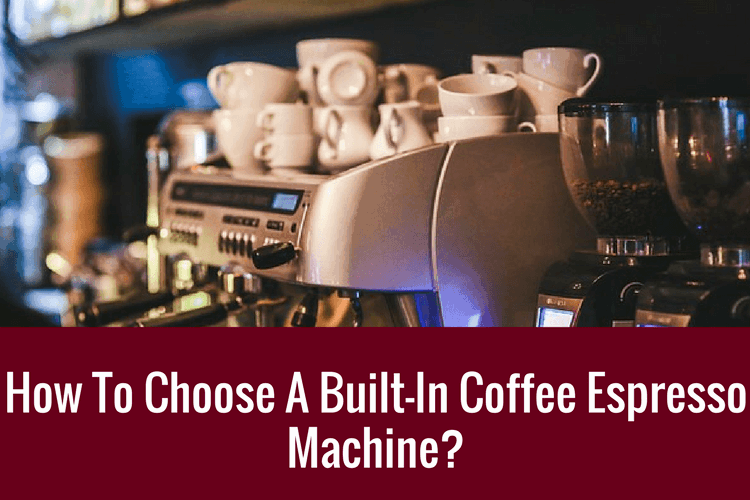 Before you purchase a built-in coffee machine, there are some more things that you need to know that will help you choose the best available machine for you. As you can understand, not all integrated machines provide the same benefits to the user and not all of them have the same plethora and abundance of options. This is especially important. As it is built-in, you can expect a hard time cleaning if there are no parts that are removable. Imagine the pain of dismantling and re-assembling, in and out of the hole in the wall. Ideally, you will get one with removable brew group. That is because after every 5 to 7 coffees, it would be good to wash them and once thorough wash per day. Otherwise, you might face some abnormality in the taste of the coffee. If the one you wish to get do not have a removable brew group. Then, you will need to check their automatic cleaning, in which you will use a capsule provided by the producer. One small tip. Always check the insurance, those with removable brew groups generally have insurances for a shorter period of time. Does It need A Line For Water Supply? A debatable one. A water line eliminates the need for refilling. One the other hand, it can impede the grandiose design of your kitchen. Imagine the water line piece is on the right and you line is on the left. Or that the water source is further down the table. That is really important because it may not only determine which product you can get, and also the position in which you can place it in your kitchen. An alternative is to get one with a large water tank. You will get to choose where to place it then. Are You Able To Adjust The Grind? A small thing that we like is the ability to adjust the fineness of the coffee grind. All of them do not have the same amount of grind settings. To give you a general idea, there is a control panel in each built-in coffee machine, in which you can change the coffee parameters infinitely. As you can imagine with more settings you have more control and more options for your coffee. It is also important to check the size of the bean hopper and how tight the lids are sealed in each machine. Larger hopper means filling less often and tighter seals mean that beans stay fresh longer. This might not a make or break decision though. As there is always the option of a separate grinder. If you are seriously considering taking a look at those new integrated coffee machines which provide much more than the ordinary perfectly adequate making of the coffee. Here are the 3 best options that I have for you. Starting with the Thermador built-in fully automatic coffee machine. This is an integrated coffee machine that is capable of fulfilling every coffee passion you may have. I have to say, though, that this one is more properly-suited for you out there who prefer a more traditional looking coffee machine, which should not change drastically the decoration of your kitchen. Thermador exerts a constant 19 bars of pressure for each and every cup. Combined this with the dual spouts, you should get fast and nice espressos in a jiffy. This machine can remember up to 8 of your favourite drinks for an easier preparation. For easier cleaning, it does have an automatic rinse cleaning for the brew group and steam cleaning for milk system. Remember what we said above? This model do have a water filter to make extra sure that what you ingest is clean. You can also adjust the water hardness with it. The built-in sensors is helpful in nudging you when the water is going to be insufficient or when there is not enough beans. If you consider yourself more of a tech guy, then the Bosch Built-In Coffee Maker would be the perfect choice for you. First of all, it has such a modern and techie design that makes it so elegant and is capable of adding a touch of elegance and design in every kitchen. Moreover, this coffee machine can connect to your phone, tablet, laptop or even desktop. Using that, you can adjust the settings and select the beverage that you want to drink from a vast variety of choices. To top it off, when it is gets ready, you will get a notification to go and enjoy your beverage. For cleaning, this model also makes it easy by having automatic cleaning, descaling and milk steam rinsing. As with any good in-built model, the machine should give a consistent pressure. In this aspect, the Bosch lives up to expectations with its AromaPro. Though for grinding, It is kind of counter-intuitive at first as you will normally choose between coarse or fine.. For this machine, you gets 2 options. Light or Dark coffee. This have a larger water capacity at 2.4 liters. In addition, you will get to adjust your coffee mug size. These 2 features makes a big plus as US mugs are often larger. The SMEG CMS6451X Built-in Bean-to-Cup Coffee Machine ensures you that you will never have a problem of overuse, and the flavor of your coffee will never be blemished. Why? Because this machine contains an intelligent self-cleaning function that cleans the machine every time you turn it off and on. That means that even if you haven’t cleaned it after a lot of uses, other flavors will never be transferred to your freshly brewed cup. In addition, the touch application is very user-friendly something that means that everyone can use it. With 5 levels of coffee intensity, selecting the brew for the day is intuitive. A strong brew for a hard day. You get the point. If that is not what you want, the espresso is highly customisable. With the ability to vary your coffee temperature, grind, water hardness and coffee volume, you will get what you need most for the day. Just want a tea? The hot water only function will get you that easily. This is really a close call. I had a hard time choosing between these 3. After almost pulling out all my hair, i decided that I would go for Bosch. I’m one of the laziest people and I would love to avoid filling the water tank regularly. The Bosch coffee machine also won me over with its ability to connect to my home Wi-Fi network. Just the idea that I can program to make my coffee while I am still lying in bed and have it ready at just the right time seems like a dream come true. If you are technology aficionado, the Bosch built-in coffee machine is just what you were looking for and didn’t know you needed. Just imagine waking up in the morning and asking “Alexa” (or “Siri”) to prepare your morning coffee. On top of that, I really love their huge variety of different beverages this machine can produce. I love trying out different types of coffees on a weekly basis. In any case, built-in machines are the ultimate luxury to start, implement or end your day and a necessary lifestyle addition. Therefore, whichever machine you end up choosing will certainly change your daily coffee routine.